First War of Indian Independence is a term predominantly used in India to describe the Indian Rebellion of 1857. The event challenged and ended the power and control of British East Indian Company in India to be replaced by nine decades of British colonial rule, known as the British Raj. In India, the term First War of Independence was first popularized by Vinayak Damodar Savarkar in his 1909 book The History of the War of Indian Independence, which was originally written in Marathi. 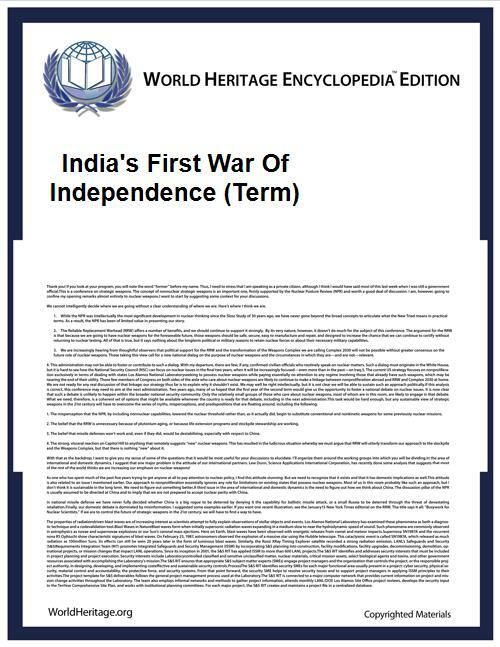 Jawaharlal Nehru, the first Prime Minister of India, insisted on using the term First War of Independence to refer to the event, and the terminology was adopted by the Government of India. The British and colonial press along with contemporary European referred to the events under a number of titles the most common being the Sepoy Mutiny or the Indian Mutiny. Contemporary 'anti-imperialists' viewed this term as propaganda, and pushed to characterize it as more than just the actions of a few mutinous native soldiers although the term The Indian Insurrection was used in the British and colonial press at the time. Karl Marx was the first Western scholar to call the 1857 revolt a "national revolt", though he used the term Sepoy Revolt to describe the event. Some Punjabis have opposed the use of the term First War of Independence by the Government to describe the 1857 revolt. They insist that the First Anglo-Sikh War (1845–46) should be called the First War of Independence instead. In May 2007, the Lok Sabha Deputy Speaker Charanjit Singh Atwal and three other MPs from Punjab protested against the commemoration of the 150th anniversary of the 1857 revolt over this issue. Some South Indian historians have also opposed the use of the term, and have unsuccessfully taken the issue to the court. These historians insist that several other anti-British uprisings in South India (such as the Vellore Mutiny) had preceded the 1857 revolt, and should be called the First War of Indian independence. In 2006, when the Indian postal department issued a postal stamp to commemorate the Vellore Mutiny of 1806, M. Karunanidhi, the former Chief Minister of Tamil Nadu, said that the move had given "due recognition" to India's "first war of independence". Some Indian writers also insist that none of the armed uprisings against the British in India, including the 1857 uprising, should be termed as a "war of independence", since they were not national in nature, not motivated by nationalist sentiment and only involving a minority of people or soldiers.